Become involved in the MiResCu initiative to improve survivability from cardiac arrest in Michigan! BACKGROUND Two federal grants have enabled the Michigan Rural EMS Network to help rural communities in Michigan to become involved in the Michigan Resuscitation Consortium (MiResCu) initiative. In order to meet local needs, and impact the greatest number of communities, we have developed four options that vary in level of community commitment. Over the next three years, MiREMS will be implementing these grants. Over the course of these grants our goal is to: • Establish 30 MiResCu Communities • Assist 24 additional resuscitation teams adopt HP-CPR methods as the standard response to cardiac arrest by emergency responders in 24 communities. • Train 400 Emergency Responders in HP-CPR by 12/31/2015 and 200 additional by 8/30/2017 • Train 220 Dispatch Personnel in Dispatch Assisted HP-CPR. • Fully integrate Dispatch Assisted HP-CPR in 20 communities • Train 600 Law Enforcement Personnel • Recruit 50 communities to participate in data collection and reporting system consistent with CARES Registry • Train 60 individuals in maintaining and collecting AED and data system • Distribute 120 AEDs in 30-40 communities • Assist 20 local communities in implementing Annual Community events. • Help teams provide training to 600 community members in HP-CPR and AED use. REQUEST FOR SUPPORT/TRAINING Simply complete the contact information under Request for Support/Training below and our training coordinator will contact you. You may also email info@mirescu.org for additional information. APPLICATION PROCESS TO BECOME A MIRESCU COMMUNITY DEADLINE: Must be submitted electronically by November 2nd . Forms may be submitted in three ways: 1) By pressing submit at the end of this electronic application form. * 2) By email to info@mirescu.org 3) By fax at 1-888-709-1718. *If your submission was successful, you will receive and e-mailed confirmation. If you do not receive a confirmation, please contact us. ELIGIBILITY : Grant funds are restricted for use in federally designated rural communities. However, MiResCu is committed to promoting a culture and system change throughout Michigan. If your community is not a federally designated rural community, please contact us for additional information about obtaining technical support and/or training from MiResCu. HOW TO DETERMINE RURAL ELIGIBILITY You can determine county eligibility by visiting http://datawarehouse.hrsa.gov/RuralAdvisor/RuralHealthAdvisor.aspx . If you have rural areas within your county but your county as a whole is not designated rural, you can use the same link to check a specific address where you would like to hold training and/or place an AED. AWARDS: Three award cycles were granted beginning with 2015. The first year communities have already been awarded, therefore this application round will award communities for the 2016 year. We anticipate supporting 30-40 communities over the grant cycle. If you are interested in applying, fill in your contact information in the next section and complete the MiResCu Community application included in this form. If you only have a paper application, go to http://www.jotform.co/form/51770525231853 to complete an electronic application, or fax your completed form to 1-888-709-1718 . You can also scan your completed form and email to info@mirescu.org . Deadline for MiResCu Community Applications is November 2, 2015 . An additional application period is planned and are contingent on year 3 funding from the Office of Rural Health Policy. Although three years of funding was awarded to Michigan Rural EMS Network for Network Development and AED placement in September 2014, year two and three funding are subject to the annual federal budget process. 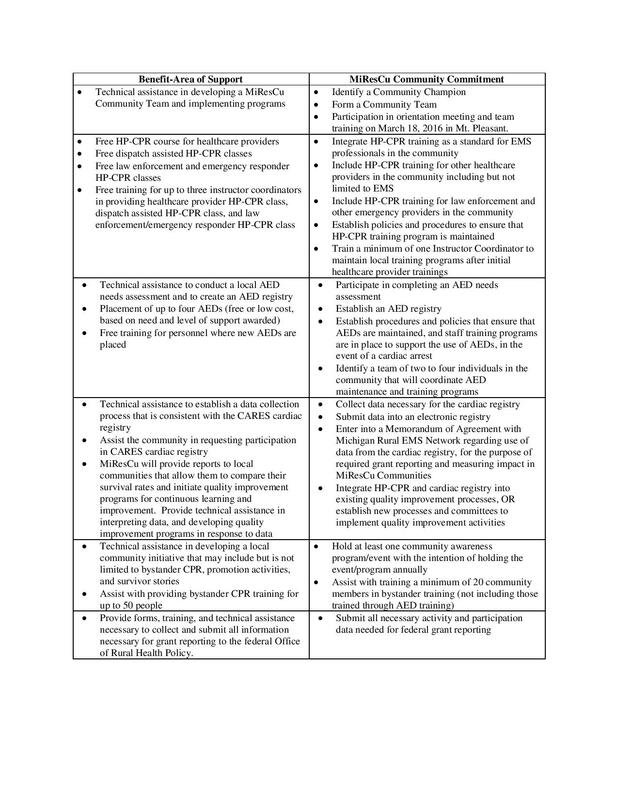 NOTE: If your community is interested in High Performance CPR but are not able to meet the requirements of a MiResCu community, please contact Mark Becmer at 231-350-3447 or by email at mark@mirescu.org. Funding Strategies Workshop Information regarding the MiResCu support opportunities will be presented in a Funding Strategies Workshop. The workshop will also present information about other funding sources and AED access programs. The webinar will be held October 16, 2015 at 1:00 pm . A recorded version of the webinar will also be available. An in-person workshop will be held at EMS Summit on Saturday, February 20, 2016 at Bavarian Inn Lodge in Frankenmuth. Email info@mirescu.org to register for this training. This training is HIGHLY recommended for support. Is your organization currently a member of Michigan Rural EMS Network (MiREMS)? If yes, how long has your organization been a MiREMS member? Did a representative from your organization participate in a Funding Strategies Workshop offered by MiREMS? Community Description We recognize that each rural community is unique. In order to best meet the needs of rural communities across the state of Michigan, we are asking that each application includes information about the community that will participate in this project. What is the population of the chosen community? Which EMS agency/agencies will be involved in your project? Describe the anticipated level of involvement of the EMS agency/agencies listed above. Which EMS agency/agencies that serve your community will NOT be involved in your project? Please explain. Community Need Our goal is to provide support to communities with demonstrated need, thereby making it possible to serve more communities and make a larger impact. Why does your community need support to implement the components of the MiResCu Community program? Please provide economic factors that demonstrate need for your community (examples include but are not limited to median income, poverty rates, unemployment, free/reduced lunch program eligibility, uninsured rates, Medicaid rates, etc)? Community Readiness While we would like EVERY rural community in Michigan to be a MiResCu Community, we recognize that not all communities are ready to make the commitment necessary to effectively implement the program requirements. In general, in which ways is your community ready to implement the MiResCu Community programs? Have you identified a MiResCu Community Chairperson? If yes who is the Community Chairperson,and what is his/her role in the community? Have you already begun to assemble a team? If yes, list team members respective roles and agencies they represent. Teams should have someone represented from EMS, FIRE, LAW and Civilian. Will at least two team members be able to attend the team orientation meeting on Friday, March 18, 2016 at Comfort Inn & Suites and Conference Center in Mt. Pleasant? What is the willingness of key decision makers in your community to integrate HP-CPR into standards, policies, protocols, etc.? Approximately how many healthcare providers are currently trained in HP-CPR in your community? Did this training include equipment capable of measuring HP-CPR quality? What challenges do you anticipate in the implementation of dispatch assisted HP-CPR training, or training of law enforcement or other emergency responders? Does your community include an individual that has completed an HP-CPR trainer course? If yes, who? How many instructors would you like to have trained as HP-CPR trainers? Include their name(s) and agency affiliation if known. Has an AED needs assessment been conducted in your community? If yes, by whom? Please describe the results. Does your community have an AED registry? If yes, who maintains it and how is it currently used in the event of a cardiac arrest? Describe any policies that are already in place in your community regarding the use and/or maintenance of AEDs. Has your community ever received an AED grant or award from another entity? If yes, from where? Have you identified an individual that will be responsible for the maintenance of AEDs and ongoing training programs? Does your community currently collect data on cardiac arrest outcomes? If yes, who collects the data? Do the hospital(s) and/or EMS agency(ies) in your community participate in CARES or another electronic cardiac registry? Please explain. How will participation in a cardiac registry enhance your current quality improvement processes? What activities are conducted in your community regarding awareness of cardiac arrest? Describe one or more awareness events that you plan to implement in your community. Who will be responsible for collecting and reporting the number of people who have participated in activities developed and implemented as part of your MiResCu community project? Please keep in mind that reports are mandatory and sent quarterly in addition to following each training course. What challenges do you see in collecting or reporting participation data? Is there any additional information that you feel is important for us to know when considering your application? Thank you for your interest in the MiResCu Community initiative. Applications must be received before 5:00 pm on November 2, 2015 in order to be considered in Round Two. Late applications will not be considered. Awards will be made no later than December 1, 2015. If you have questions regarding this application, please email info@mirescu.org If you have completed the online application, please press the submit button at the bottom of the page. If you have completed the paper application, please scan and email to info@mirems.org . For more information about Michigan Rural EMS Network and the MiResCu initiative, please visit www.mirems.org .